Bring home our stylish Rhodes bar stool chair, perfect for kitchens and breakfast bar corners. 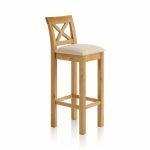 It's constructed from hard-wearing solid oak in our natural finish, which brings out the natural wood grain patterns. 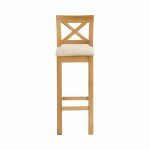 The back features a delicate low crossed motif, which adds a touch of modern farmhouse appeal to the piece, and the stool's seat pad is upholstered in cosy Plain Beige fabric. The Rhodes bar stool is entirely constructed from 100% solid oak for durability and strength, year after year. 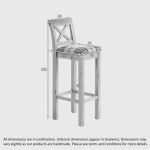 Don't forget to check out our coordinating backless stool too. Shop the full range today, and rest easy, knowing it will stand up to cocktail parties and family breakfasts alike.